Why does real estate honcho James Barry III hide his home's ownership? Mysterious $1 Million Lakeside Mansion. Photo by Michael Horne. This winter, The New York Times ran a series of articles about the increasing use of “shell companies” to hold residential real estate titles, thereby shielding the identity of the owners. In January, the Treasury Department announced it would track the owners behind the shell companies for all-cash real estate transactions in the Manhattan and Miami markets, where the practice is most common. The government is concerned the transactions may be used to launder funds, escape taxation, or be involved in other suspicious financial activity. They promote privacy, “since only the trustee (or the trust name) appears on title, the beneficiary remains private,” writes Alex Everest in Deal Maker Library. “Judgments and liens against individual beneficiaries do not attach to property held in a land trust.” This includes IRS liens, he writes. The practice is not limited to New York City. It can be found here in Milwaukee. Urban Milwaukee has identified two properties on N. Wahl Ave. that are registered to land trusts, and House Confidential will pierce the shell of the mysterious 2443 N. Wahl Avenue Trust, which owns the historic 6,000 square foot Charles Rollins Manville House at that lakefront address. The trust paid $1,117,200 in 2005 for the home. Do we have a drug dealer, a Russian oligarch, an exiled monarch or other shady character living in the home? Fear not! It took very little effort to pierce the veil of secrecy to determine this mansion is owned by James T. Barry III, 52, whose family has been involved in commercial real estate here for three generations. No Barry has ever appeared “broke to the public,” so if that was the intent of his obfuscation, it didn’t work. Perhaps he got so used to hiding the identities of his corporate clients that he sought to appropriate the tool for his own residence, which he shares with his wife, former justice department attorney Nora Sheehan Barry, who uses this as her address on the Wisconsin Bar website. James T. Barry III had this address on his Driver’s License when he was pulled over by the Milwaukee County Sheriff‘s Department on September 6th 2012 for failure to obey an officer’s directions. That indiscretion cost him a $178 fine. A search of city records also shows that this single family residence is owner occupied, so we may assume that this is the Barry family residence. 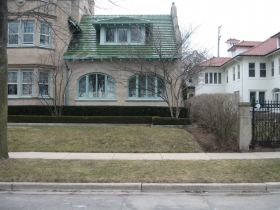 Furthermore, the Wisconsin Architecture and History Inventory lists the “James T. and Nora S. Barry Home” as an alternate name for this home. This is one trust that was easy to bust. 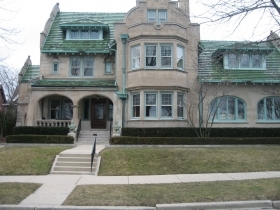 This $20,000 home was built in 1907 by architect Henry A. Betts for Charles Rollins Manville [1866-1920], the son of Charles Brayton Manville, who began an asbestos insulation company in this city in 1885. The father moved to New York while the son stayed here to manage affairs locally. The firm became known as Johns Manville by 1901. 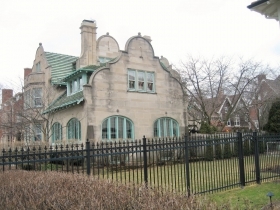 A 1917 addition to this home by Herman W. Buemming provided the 25-foot by 29- foot porte cochere to the south and some rooms above the covered vehicle entryway. 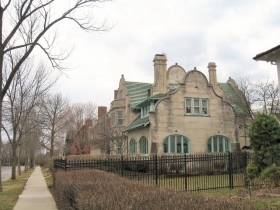 When Charles R. Manville died in 1920, his wife Edith C. Manville received this home, $500,000 in cash, and one third of the remainder of the $2,000,000 estate to be shared with Charles’s two brothers. Today, a surviving spouse would have gotten the whole works. Sure enough, we find that on April 26th, 1945, a new gas fired boiler had been installed to replace the old coal stoker for then-owner Louis Carter. In 1962 the home was listed as a “Townhouse for a Gentleman.” The owner was moving to California, and this “ageless Bedford Stone home” was available, with “carpeting, drapes no extra cost.” The second floor had four bedrooms, three baths and an office space. Never mind that there was no separate entrance to the almost another home, and you had to go through the second floor to get there. The home was purchased in 1962 by Herbert and Jill Heavenrich for $50,000. They installed a new patio by society landscape architect Judith Stark, and lived there with their active family of five children. Herbert Heavenrich [1923-2011] was chief economist for the City of Milwaukee in the late 1960s and later director of Urban Planning for the Department of City Development. He then made some real money in mergers and acquisitions. They lived with their custom grade stone garage, a solarium and rooms with elaborate ceilings, cast ornamental trim and other refinements. A 1980 fire escape which gave the attic dwellers a new way to get to their apartment ($300 per month, plus shoveling), “will add absolutely nothing to the value of this mansion,” the assessor wrote with some disappointment. In 1978 somebody was keeping an eye on the Heavenrich home, or perhaps they were sniffing around, but in any event, on January 16, 1978 the building inspector sent a stern violation letter to the occupants. 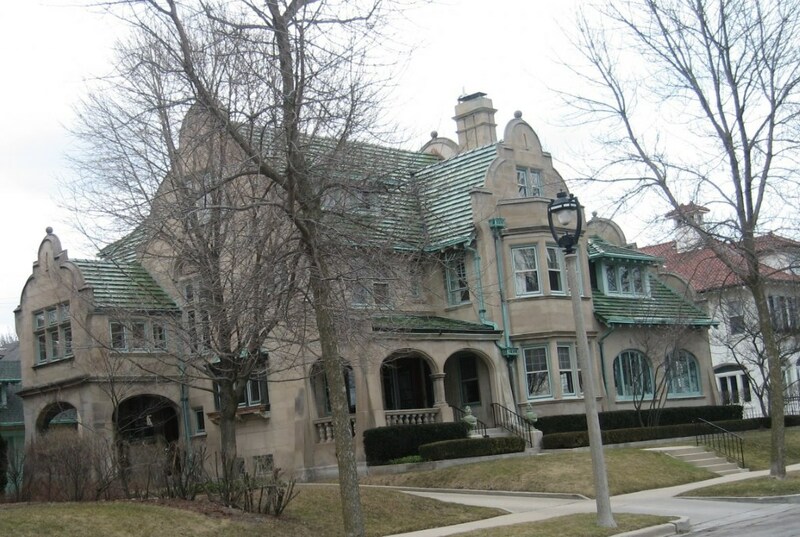 On April 19th, 1978, Jill Heavenrich, who now lives at St. John’s on the Lake, got a variance to operate her cooking school in her east side mansion for the period of a year. Although real estate magnate James T. Barry III has no compunctions about hiding his ownership of his home, he feels quite differently about diluting the name of Barry in his real estate ventures. In September 2015 the firm adopted the Barry Co. name. Previously it had been DTZ Barry, and before that Cassidy Turley Barry, after abandoning its original James Barry name from its 1921 founding by the current Barry’s grandfather. Assessment: Land: Current location: 12,000 s.f. lot is assessed at $171,800 [$14.32/s.f.]. Improvements: $884,900 Total: $1,056,700. Current owner purchased for $1,117,200.00 in 2005. Taxes: $30,809.47 paid in full by owner. Garbage Collection Route and Schedule: Pink CP1-3B. Tuesday. 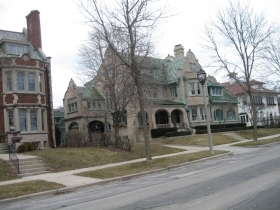 Polling Location: St Mark’s Episcopal Church, 2618 N Hackett Ave.
How Milwaukee Is It? The Residence is 3.2 miles from City Hall and 3.9 miles from the Court House. Surely Darienne Driver’s assessed value is a typo…..14 million??????? The South part of the mansion, with the port cochere & room above is original to the building – in the North Point Historic Districts book, there is a 1908 photo, with the port cochere with room above, and nothing shown to the North- you can even make out the Eschweiler house on Bradford, before the corner house to the North was constructed.. 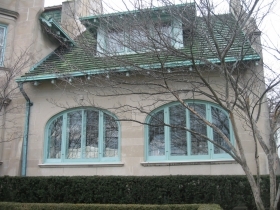 The solarium addition is listed as ‘North Addition Herman Buemming 1919’ .